Integrity appears to be a scarce commodity in the times in which we live. Many business owners would testify to the fact that one of their biggest problems is finding trustworthy and reliable people to work for them. Some have even given up on ever finding people of integrity to work for them. Such a situation appears bleak, but it also presents an opportunity for people of integrity to rise above the fray and distinguish themselves. This reminds me of Daniel and his friends who rose to a high rank in the government of a nation where they were brought as captives. I’m also reminded of Nehemiah, who the king could give building materials and trust he wouldn’t divert them but would use them. Integrity will distinguish you and cause you to rise to heights that you probably never imagined. So how do you develop integrity? The first step as a child of God is to recognize and accept the fact that you subscribe to a higher way of thinking and living than those who don’t know God. You must know for yourself that the Bible is your constitution for living, your road map for navigating the unpredictable twists and turns of life. You cannot afford to be one of those Christians who think that the Bible isn’t for the real world, that you cannot apply the principles of scripture in business and succeed. You must form the habit of going to the Bible for answers to every question you have and solutions to every problem you face. As you do all of these, you’re well on your way to building integrity into your everyday life. Next, you must consciously keep your heart tender towards God. You do this by spending time in prayer and the Word and then being prompt to obey the leadings and instructions God gives you by His Spirit. Don’t be fooled into thinking that your heart cannot become calloused and insensitive to the Holy Spirit’s gentle nudges. It doesn’t happen overnight and you do not want to go down that road. Keep your heart responsive to Him by filling your heart with His word and consciously meditating on it; move quickly and fully whenever the Holy Spirit prompts you to do something. Don’t ignore Him and don’t argue with Him, just obey Him. Do this consistently, over time, and you will find that your heart will remain responsive to Him. 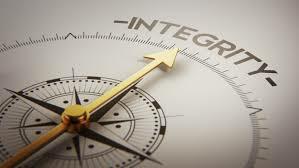 Integrity is your spiritual DNA, you’re not bent and crooked on the inside anymore. God has straightened you out in your spirit and made you able to walk in His high calling for you. Don’t settle for a life that isn’t yours; henceforth make up your mind to be a person of integrity in speech and conduct. That is one way your light will shine before others and cause them to give glory to God.